Lego make farm sets very well, and a big range they make too. Our top ten list should open your eyes to the available range and help you make your mind up beforehand. Lego's very own farm set range is so extensive we've had to make the hard choice of leaving out playset's, and some of these are still very nice. But rest assured we've taken every care to insure all Lego farm sets below enter our top ten list on merit and not just because they should be listed. The Lego farm toys we've listed below are known to be expensive, but there can be a few cheaper models - though you might be surprised. Topping the most featured in our list is the Duplo range in the 2 to 5 years range, closely followed by the Duplo 18 months to 5 years. 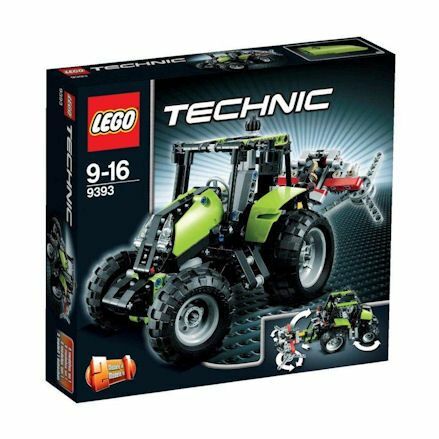 Making an unlikely appearance with it's big price tag, putting off many, features the Lego Technic tractor and the more reasonably priced Creator and 'Build & Rebuild' set. Our list is based on our personal opinion, we've taken a look at all available Lego farm set's and compiled our favourites below, leaving out several sets. 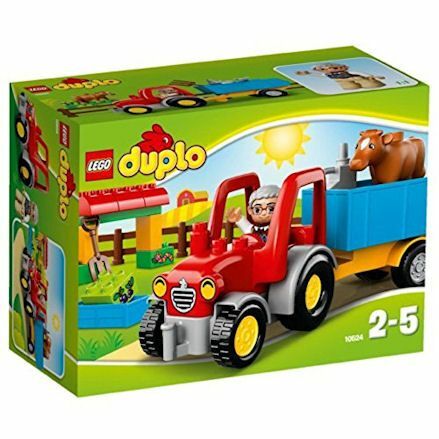 Thanks to it's stunning look, wide age range and an incredibly good price for Lego themselves, all this makes this Lego Duplo My First Tractor one of the best selling models in whole Lego farm range in the UK. The blue tractor has free-rolling wheels and can be hooked up onto the red trailer for pulling a bunch of educational value bricks featuring fruit with it's corresponding colour. Also features two figures and a wooden effect crate. We must also mention this one has educational value, and the reason why its targeted to todders age one. The pictures on the bricks will help them samilarise themselves with what they are over time. A Lego tractor at a price you can afford, which is the big selling point for this model. This stunning red tractor comes with an old man driving figure and a big blue trailer. It features a single structure, cow, trough and fork. 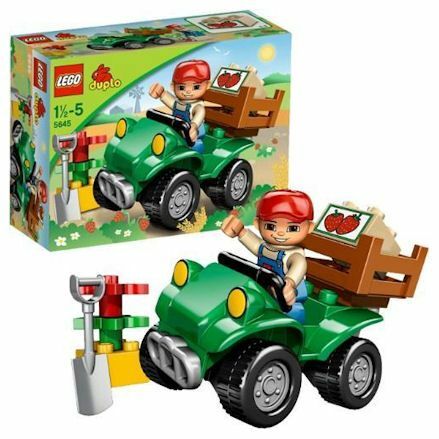 Match this tractor up with Lego farm or pair it up with farm animals in the Duplo range. Well the figure goes behind the wheel, the cow can be transported in the trailer. This is not a static model, but a set that does have function in the free rolling wheels, so kids will appreciate they do actually work. 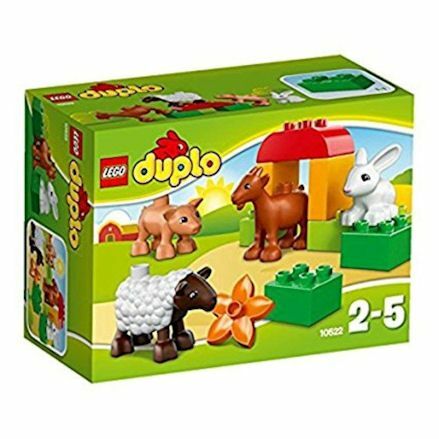 If you've got a Lego farm set in the Duplo range, you'll add real play value with the introduction of this set of 4 farm animals. But what makes this set more appealing is it can be used as a stand alone item with a few extra bricks available. 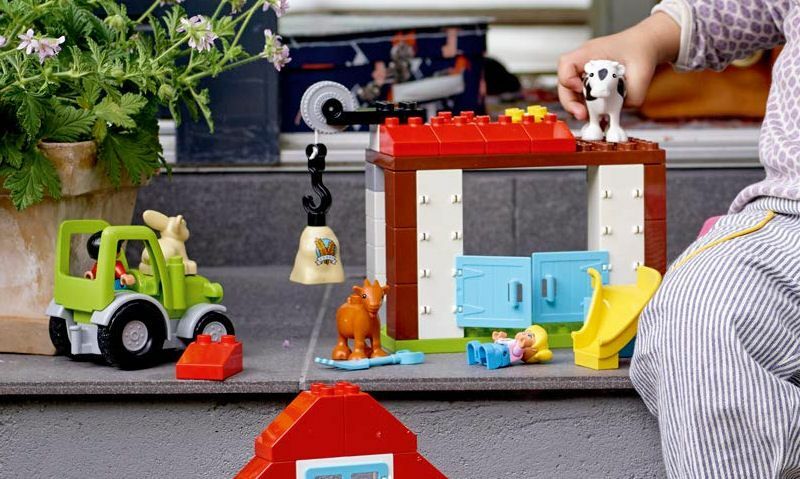 There's limitless possibilities you can do with these animals, but a popular choice is mixing and matching the animals with a farm set from other brands. Sure it does lack bricks, but there's opportunity to add extra sets later at your discretion. When it comes to a price of a good toy farm set you'll expect to pay a much higher price, but Lego have done well here to sell this three year old set for around £50.00. 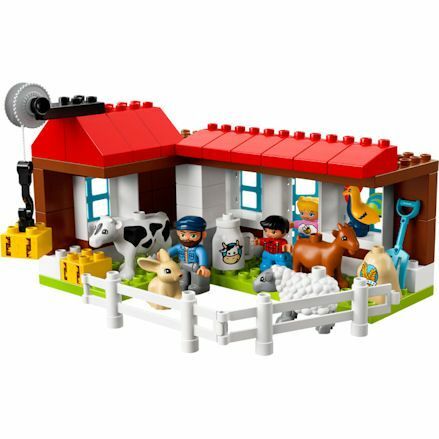 This complete Lego farm set features 3 big farm buildings - one with working winch - a tractor, 2 figures, farm animals and accessories. But thanks to it's recommended age the set appears to a wider audience, which makes it a top seller. Its a rarity Lego sets come with a tractor, so take note of this when looking at similar models as you'll end up splashing extra cash on a tractor if not included originally. 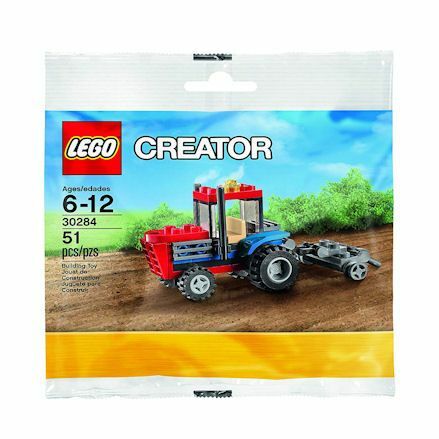 This Lego Creator Tractor is as simple as it gets, but very effective with kids and a comfortable price for parents well still boosting the Lego brand. The tractor does not come in a fancy retail box but a plastic packet - ready to be assembled - which probably helps with it's reduced price. Due to it's small size, this tractor and plough set will fit in with an assortment of farm toy brands other than Lego. Again, a small one but it still boosts a whopping 51 pieces; all those bricks just a built this small tractor should keep them busy. Smaller but highly entertaining Lego My Town Farm, suitable for 2 to 5 years. 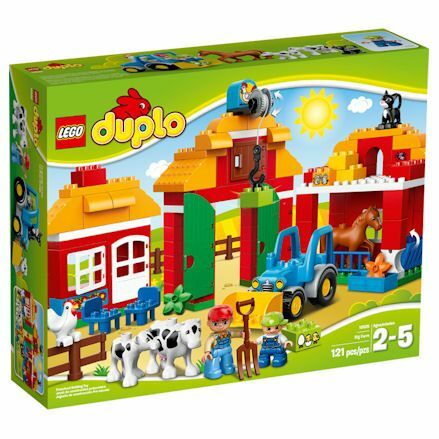 This set includes two building acting at the farmhouse with the other building used as a farm animal shed, barn or anything imaginable. This being Lego both buidlings design can change well they add or remove bricks. But all the peices are there if they wish to replicate the original design. This includes windows and a door for the farmhouse, with the option to connect the working winch to create a barn - there's also bales, a slide and a fun tractor. They set is complete with three Lego figures and a bunch of animals, including; cow, goat, sheep and a bunny rabbit. A throw back to how Lego used to be, just a bunch of bricks with a variety of shapes available to build anything your imagination will take you. 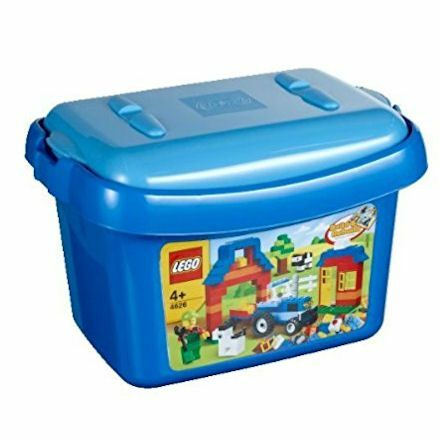 In this solid plastic box of Lego you'll find you can build a farm house and barn front, tree, cow, tractor and trailer and an iconic Lego figure. This set is targeted to kids 4 years and up but relistically will last much longer. They are not restricted to play farm here, anything can be built with amazing sets when you add even more bricks. When you think of a toy tractor you'll expect it to look just like this one, but due to it chunky, childish look it's probably more suitable for just 2 years, despite the recommended age up to 5 years old. 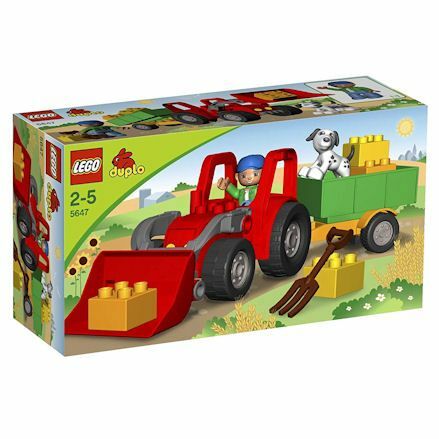 Its a fun set this, with twelve pieces in all, including the tractor and trailer, functioning front loader with tipping bucket, a driving figure, dog and yellow bricks that pass as bales of square hay. There's a chance here to add this set to a matching farm set where a tractor and trailer is desperately needed, and this one will do it. A four year old Lego Technic model that boosts both a buggy and a tractor, which resembles a Claas tractor. The average cost of this item is quite frightening, but due to it's age range of 9-16 years it does tap into a specialist market with both educational and activities for young adults. A functioning model, it comes with working steering and detachable tool that unfolds, lowers and spins. Once you've built the tractor, try to put the bigger together, its just a shame this set doesn't come with a trailer, as it realy would complete the set. This one has been around for a while and built up quite a fan base, largely because it's been available to buy for the last 6 years or so. The Lego Farm bike is has simple as it gets; featuring a bike, driver and a few accessories to maintain the fun. Its a small piece of kit from Lego but does just enough to get in our top ten. 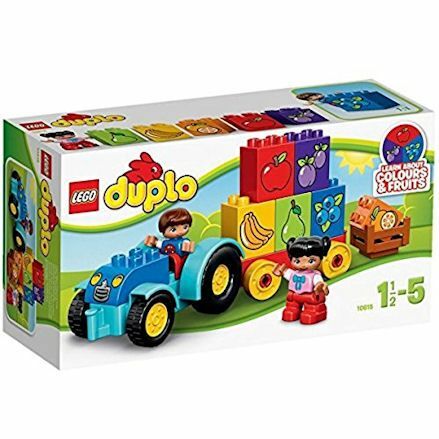 Keep a close on a similar Duplo sets from one and a half years old to match with this tractor so the set can be extended over time.